"We all work too damn hard trying to make our kids lives amazing and magical…" STX Entertainment has debuted the first official trailer for Bad Moms, the summer comedy starring Mila Kunis, Kristen Bell and Kathryn Hahn as "bad moms". The three play overworked, stressed out moms who go crazy being free-spirited, anti-perfect moms - clashing with the head of the PTA. The cast includes Jay Hernandez, Clark Duke, Annie Mumolo, Jada Pinkett Smith and Christina Applegate. This is the funniest if you are also a mom, but if not, well you'll see. I can assure you none of the jokes made me laugh at all. STX put out a green band and red band trailer, with dirtier jokes in the latter, so if you're curious check this out. In this comedy from the writers of The Hangover, Amy has a seemingly perfect life - a great marriage, over-achieving kids, beautiful home and a career. However she's over-worked, over-committed and exhausted to the point that she's about to snap. Fed up, she joins forces with two other over-stressed moms on a quest to liberate themselves from conventional responsibilities – going on a wild, un-mom-like binge of long overdue freedom, fun and self-indulgence – putting them on a collision course with PTA Queen Bee Gwendolyn and her clique of devoted perfect moms. 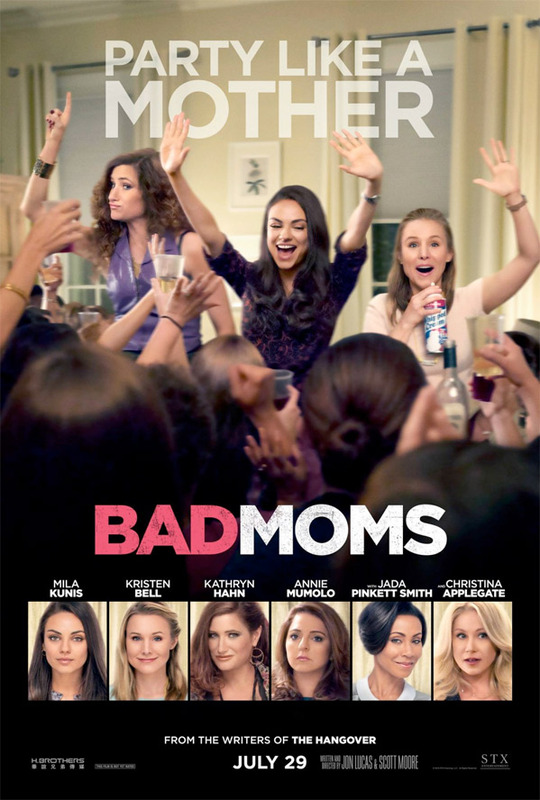 Bad Moms is both written & directed by filmmakers Jon Lucas & Scott Moore, of only the comedy 21 & Over previously. STX Entertainment will release the film in theaters everywhere starting July 29th this summer, the same day Jason Bourne opens. Anyone? I was already worried about watching the trailer, no way I'll watch this ever. This looks like The Boss. Meaning it's gonna be really mediocre, but it's gonna have some great moments. LOL shite this is going to piss off my wife so much. Women are indeed each other's worst enemies. No f'in middle ground. With that said... yes this movie is downright terrible. But whatever, they make movies today like they make diapers. The "women acting like scumbags" genre is hot right now. ALSO, THIS LOOKS ACTUALLY FUNNY!!! unlike all the other comedies coming out right now. I'm tired of the same old "dad gets a hall pass/has fun without repercussions" it's the ladies' turn. Sounds like a Seth Rogen movie that got Feiged.